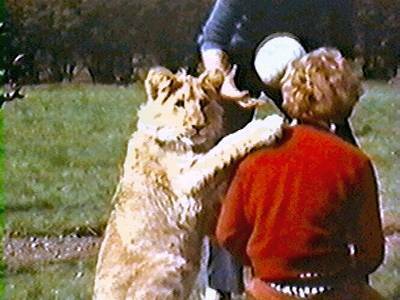 The decades-old footage of a full-grown lion joyously embracing two young men like an affectionate house cat has made myriad eyes misty since it recently landed on YouTube. What is it about the old, grainy images that has attracted millions of clicks around the globe? Is it simply that a lion, whimsically named Christian, remembered the two men who raised it and then released it into the wild? 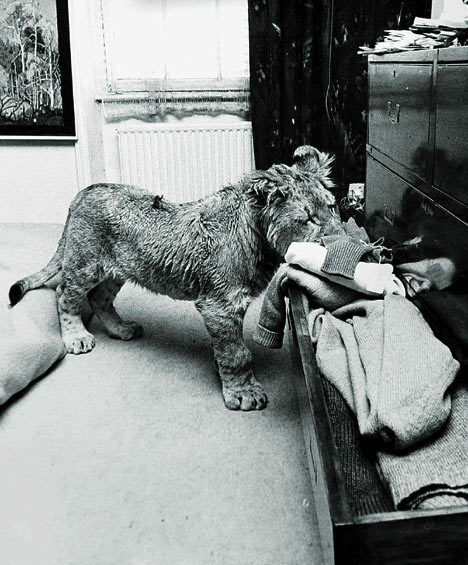 Is it nostalgia for a simpler time 39 years ago, when you could walk into Harrods department store in London, stroll through the “exotic animals” section, and buy a live lion cub? Is it a longing for the swinging Austin Powers-era London of 1969, when you could take the beast home to a basement flat, play soccer with it in a walled garden — and even take it out to restaurants in the back of a Bentley? The answer may be all of the above. But it may be something more: the indelible image of a creature that could kill a man in seconds behaving like a pussycat with two men it obviously loves, smack in the middle of the African bush. TODAY played part of the video last week with little comment or introduction, and when the grainy footage, originally shot on 16-mm film, was finished, Meredith Vieira was among many in the studio wiping away tears. Back in ’69, Rendall was living on Kings Road, in the Chelsea section of London. The center of London’s counterculture at the time, Kings Road seethed with creativity and fashion. Even Mick Jagger once resided there. In the lingo of the day, it was wild. And it was into that milieu that Rendall and his friend Bourke would introduce something even wilder: A real, live lion. Having grown up in Australia’s sparsely populated outback, the young Rendall was agog at the capital of the British Empire. Where he came from, there was one store where you could buy any color shirt you wanted — as long as it was white. “If you asked for a blue one, they said, ‘Get lost,’ ” he said, but in slightly more colorful language. So when a friend came back from a trip to Harrods, London’s famous department store, and told a story about her trip to the pet department, Rendall was understandably fascinated. The two cubs were in tiny cages in the exotic animals section. Like a kid enthralled with a puppy, Rendall instantly became smitten and determined to rescue one of them. The notion that one could buy a lion and move it into an urban neighborhood seems preposterous today. But in 1969 London, the improbable was not impossible. 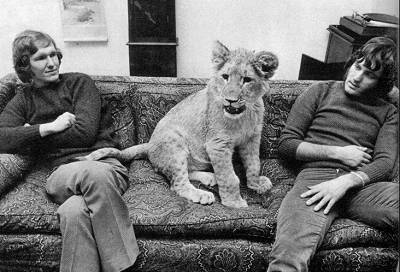 Bourke and Rendall did have to go through a long process to prove they could care for the animal, and there were others who wanted to buy the cub. But the two friends prevailed, and soon the basement of the custom furniture store where they worked had a new and exotic housecat. “We persuaded the owners of the shop that it would be great publicity for the shop if we had the lion live there,” Rendall explained. Inspired by the Bible and a sense of irony, Rendall and Bourke named the lion “Christian,” and the beast soon became a celebrity. Rendall said they took a “horse whisperer” approach to raising the animal, never restraining it and never using physical force of any kind. Instead, they indicated with their tone of voice what was appropriate and what wasn’t. But when Bourke and Christian went out, Christian went with them, riding in style in the back seat of a Bentley. He even accompanied his human friends into restaurants. For exercise, they took him to a large, walled-in garden next to the furniture shop. Christian’s favorite pastime? Soccer. After a year, Christian had grown from 35 to 185 pounds. Rendall said he and Bourke knew the lion couldn’t stay with them much longer. They weren’t worried about Christian attacking anyone, he said. It was more that he was so big he could break a window just by leaning on it. Who knew what other damage he could accidentally cause when he grew even bigger? Fortuantely, actors Bill Travers and Virginia McKenna dropped into the furniture store one day, looking for a writing desk. 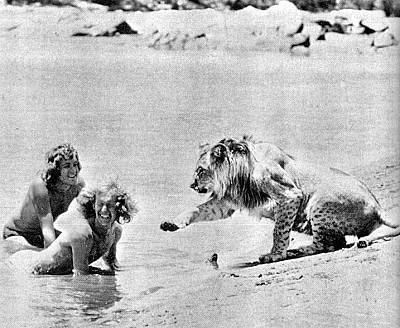 They had just finished filming “Born Free,” the famous story of Elsa, a real lioness who was reintroduced to the wild. 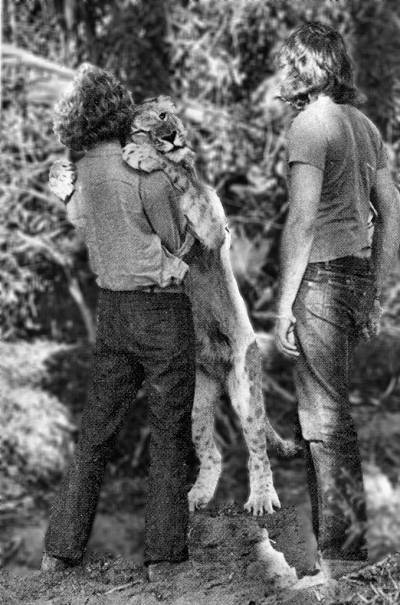 In the hit movie, the married actors played real-life naturalists George and Joy Adamson (Joy Adamson wrote the book on which the film was based). Travers and McKenna suggested that Rendall and Bourke contact George Adamson. Soon Rendall, Bourke and Christian were all on a plane to Kenya, where they and Adamson introduced Christian to something he had never seen before: his natural habitat. When the two friends felt sure Christian had a new family and a safe territory, they went back to their lives in London. But they kept in touch with Adamson and made a few visits to Kenya to see Christian from afar. The now-famous footage shows the cat approaching the two men, cautiously at first. Then, as recognition begins to dawn, the lion picks up his pace and leaps into the arms of his old roomies. The film is color, but has no sound. Subtitles have been addded to tell the story, but they’re hardly needed. 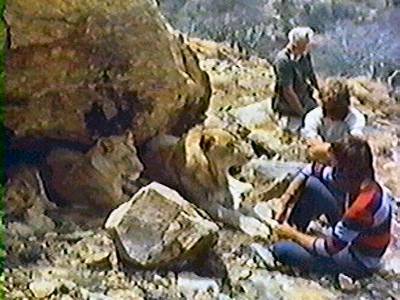 There are two men in flared jeans and shaggy hair, and there is a lion. The huge carnivore approaches from a distance, slowly at first. Then recognition sets in, and soon everyone — men and beast — are hugging and crying. Also in the original film are two lionesses named Mona and Lisa. They had been trapped elsewhere in Africa and given to Adamson to rehabilitate. Unlike Christian, Mona and Lisa had never set eyes on Bourke and Rendall before, but they came over to meet the two men anyway. If Christian vouched for them, these humans were apparently OK guys. But in 1974, Adamson lost touch with Christian for three months. When he told Rendall and Bourke, they decided to make one last trip to Kenya to try to say goodbye to their old friend. The night before they landed, according to Adamson, Christian suddenly reappeared and sat on a rock outside the naturalist’s camp — as if waiting for his pals. There was another tearful reunion and another romp. The next day Christian walked back into the bush, where his lionesses were waiting. 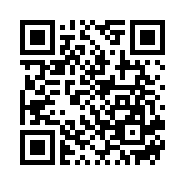 He was never seen again — but the power of the Internet guarantees he will never be forgotten. 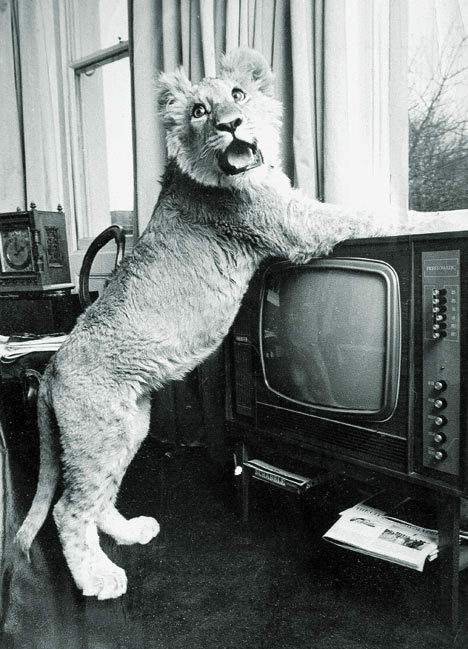 Now Rendall hopes that the sudden popularity of the old film will help wildlife conservation efforts. He has remained an active supporter of the Mkomazi Game Reserve in Tanzania and the George Adamson Trust. Tragically, Adamson himself was killed during local unrest 14 years after the video was shot.